Information security managers are getting more of a say in enterprise cloud initiatives and mobile device projects. 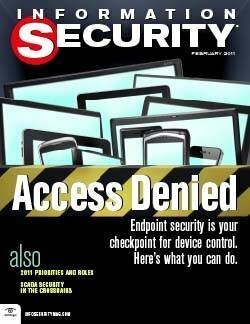 Enforcing endpoint security requires careful planning and deployment. Stuxnet put the spotlight on critical infrastructure protection but will efforts to improve SCADA security come too late? Security experts Bruce Schneier and Marcus Ranum debate whether network security should be based on whitelisting or blacklisting. Automation hasn't killed the penetration tester – yet.